GO WHILE YOU CAN, IF YOU STILL CAN. Trump may be closing off independent travel to Cuba very soon. See article from The Economist here. Well, I am writing this as a seasoned traveler throughout Latin America and a fluent Spanish speaker. I was also a Peace Corps Volunteer in Costa Rica for 2.5 years, so my experiences are not that of a typical US traveler. I will say that planning my trip to Cuba was the most challenging trip I have ever planned. Going independently as a US traveler is relatively uncharted territory. You can’t use credit/debit cards once in country. We have limited access to Cuban websites. Cuba has limited access to the Internet. So, travelling independently is not for the faint of heart. You have to be able to go with the flow. It is a great learning experience and adventure and well worth it. You will discover that Cuba is not at all what it seems from the US perspective. The Cuban people have their own stories to tell. Your visit will be so much richer if you can communicate in Spanish. We offer professional Spanish training lessons at Habla Language Services. We have put these tips together which will help you immensely. We researched quite a bit and walked through the plan once there. Of course, make sure you have a passport and one that is not expiring with 6 months. Make sure you will have plenty of cash to take. I took about $750 and spread it out in a money belt, neck pouch, and wallet. I recommend that you purchase the Lonely Planet book on Cuba and read it ahead of time concerning the locations you want to visit. Airline Ticket: Good News! You no longer need chartered flights to fly to Cuba. Book a flight on Southwest Airlines and fly directly from Tampa or Ft. Lauderdale to HAV for about $89 each way. You can even check 2 bags and your carry-ons. Mandatory Cuban health insurance is also included in the price of your ticket. When I went, SWA wasn’t flying to HAV yet. That is why I went through VRA. 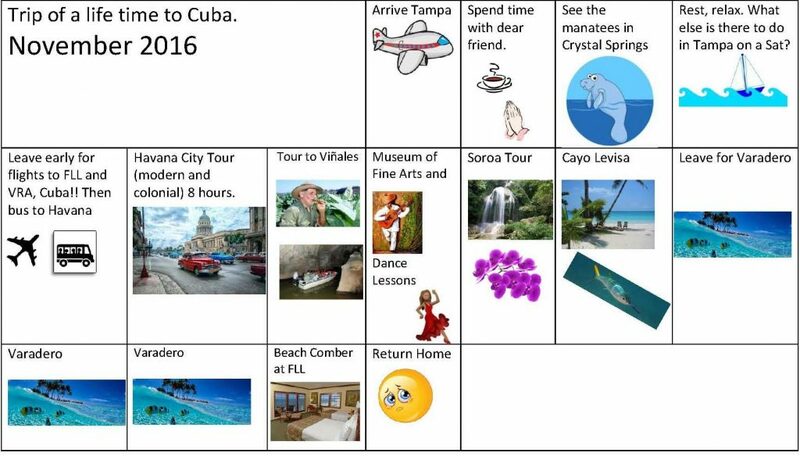 Southwest has this on their website: While in Cuba every traveler must document a full-time schedule of activities. “If you are traveling on a general license, you must document a full-time schedule of activities consistent with your designated general license category. The U.S. Government has up to 5 years after your trip to request your full-time schedule of activities.” Southwest Airlines, International Travel, Cuba website. This is a requirement of the U.S. State Department. It is not a requirement from the Cuban government. Once I realized that the restrictions were coming from the U.S. and not a communist government, I was a bit more relaxed about planning my itinerary. I did go with a full-time itinerary ready to present, but upon getting my VISA in the Ft. Lauderdale airport, nobody asked me for it. They just asked for my reason for travel and I replied, “People to People.” You are going there for a cultural exchange. Make sure you participate in some cultural activities. Cuba is not, and should not, be a trip to just hang out on the beach at an isolated all-inclusive resort. Exchange Rate The official and published exchange rate is $1US to 1CUC; however, because we do not have a direct relationship with Cuban banks, it is impossible to get this exchange rate. I tried in hotels, the official casa de cambio (CADECA), and the airport. You lose 13% anywhere, so keep that in mind, and you’re going to lose another 10% if you change back to $US before returning. Iphone (I waited until I got back to upgrade, so I had battery and storage issues). Extra iphone battery and all your cords and chargers. Waterproof camera (I had purchased this for the manatees in FL, but it came in handy as a backup camera. 4. Recommended: Backup battery and carrying case for waterproof camera. 5. Canon SX530 Powershot. In hindsight, I should have gotten the bundle that includes the camera case, memory card, and battery. Remember that the camera screens are fragile and can get scratched or cracked. You will need to protect them in a bag or wrap them in a scarf or something. I took 1000 pictures and got some great shots of the vintage cars in Habana and the orchids in Soroa. You want to make sure all your camera equipment will be ready to go! You can see Cuba photos here. HOUSING AND ACCOMODATIONS: Because you can’t use a credit/debit card once in Cuba, I recommend securing and paying for your accommodations before you go. I wanted an authentic, budget experience, so I didn’t even look at hotels. I read that the star ratings do not compare to what we are accustomed to in the US, and hotels were pretty expensive – so I don’t have much info on that. Booking a hotel is probably much easier than trying to get a casa particular anyway so here is the advice to get a casa particular. Yes, Airbnb is in Cuba!! The selections for the dates I needed were not that great, so I used an alternate source, but Airbnb is definitely worth checking out. I used www.Holiplus.com for my accommodations in Habana and Vardero. I stayed in Varadero because when we went, SWA wasn’t flying directly to Habana yet. Now, that you can fly directly to Habana, if you want a beach experience, I would recommend going to one of the Cayos. TOURS/EXCURSIONS : I used www.Holiplus.com for booking a couple of tours. They are not the best agency to deal with, but we are very limited in what we can do and where we can use a credit card, so it was still worth it to book as many tours with them as possible ahead of time. We couldn’t book everything we wanted to because they have a minimum. We were able to book the Habana Tour with them and a private tour for 2 to Cayo Levisa. MAKE SURE TO EXCHANGE MONEY AT THE AIRPORT BEFORE YOU LEAVE! Especially if you arrive on a weekend. If you don’t, the banks and CADECAS may be closed. You can usually exchange at a hotel though, but you will need local currency for transportation from airport to your lodging and for meals. On the Habana Tour, we had a private taxi driver and we were able to negotiate with her to take us to Soroa for the day. We went to the orchid garden and waterfall. It was one of the highlights of my time in Cuba. For the Habana Tour, we were picked up at a major hotel (Habana Libre). They had a CubaTur office right in the lobby. The tours to Viñales are popular and go everyday, so we booked one for the following day (Tuesday). Wednesday we spent a cultural day in the city. We took a taxi from our casa in Vedado to the center of Habana for dancing lessons with Salsabor A Cuba. We didn’t make it to Trinidad, but I have heard from many people that Trinidad is their favorite city. So, if you can, make arrangements to visit there as part of your itinerary. One of the reasons that I went to Cuba was because I wanted to completely disconnect. I didn’t even try to use phone service while there. In fact, I think our U.S. phone service doesn’t even work. Land lines seem to be predominant and you can usually use the one where you are staying or a public phone to call within country. Once my travelling partner went back to the U.S, I was left alone in Varadero, during Castro’s death and imposed mourning period. Hence, there were no parties going on, no music and so I decided to venture out and get an Internet card to try and get on Facebook and maybe make a Facetime call. Once I paid about $6 for an Internet card, I had to walk to a park for a hotspot. Once I got to the park, I still couldn’t access the Internet. I walked around and found a bunch of Cubans all huddled in one spot. THIS was the HOTSPOT. There were so many people trying to get on that the Internet was really spotty and practically useless. I couldn’t make a Facetime call and I was able to do one FB post. Hey, at least I got my 1 post from Cuba. I decided it was more enjoyable to live in the moment and take pictures of the sunset, so I left the park. 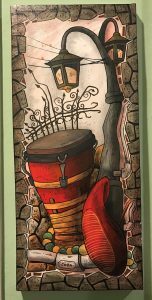 Cuba has AMAZING art and it is quite inexpensive. The thing is, you need to ask the artist for a tax certificate or official seal. The artists won’t tell you about it because it costs them money, but it is the correct way to do it. If you don’t get one, you need to obtain one at the Registro Nacional de Bienes Culturales in Vedado, Habana. If you don’t do that, you’ll have to pay at the airport and it is quite a delay. We found one of the best places to shop for art and souvenirs to be at the Fortaleza de San Carlos de la Cabaña. This place was included on our tour of Old and Modern Habana. We had plenty of time to shop the local artisan booths, but didn’t know how the prices compared since it was our first stop and seemed to be quite touristy, but in hind site, the prices were quite fair and the quality quite good. The other good shopping spot was at the old warehouse and shipping yard at Desamparados and San Ignacio. Make sure you bring plenty of spending money for art, cigars, and souvenirs. If your Spanish is good enough, you can probably haggle the prices down a bit. Travelling in Cuba independently is not easy. Both my travelling partner and I spoke fluent Spanish and I am a seasoned traveler throughout Latin America; yet, we still found it quite challenging. We forgot to exchange money at the airport and it was a holiday weekend. Fortunately, a friend had given me about $60 worth of CUCs to get by and the taxi driver from Varadero to Habana accepted our $US. Once we got to Habana, our host for our lodging was not around when we arrived and we had to knock on a neighbor’s door and then luckily the women who were checking out from the apartment let us in and said they didn’t know where the host was. We waited inside for him and tried using the land line to call him, but I didn’t know what prefixes we had to dial. He eventually made his way up and said he was waiting for us outside. I don’t know how he missed us coming in each with a large suitcase! We had many more adventures that included trying to buy feminine products for a surprise visit by Flo. Ladies, don’t let this happen to you. Tampons are virtually non-existent and pads are pretty hard to find and embarrassing to ask for. Plan for the unexpected in all areas!! Even with the little mishaps, we had a great, rewarding time. The Cubans are great hosts and hope the best for the country. They would LOVE to see the trade embargo lifted. They are all proud of their country and their accomplishments. They speak politically of their country in ways that would surprise you. I often wondered if they were “brainwashed” or if we were, or if we all are. Still pondering. . .
And to understand everything a little better, this book is hot off the presses. Wish it had been around when I was preparing for the trip! ¡Patria o Muerte! *Please note: The proper spelling of the capital city of Cuba in English is Havana. However, the spelling in Spanish – and the way it is spelled in Cuba is Habana. We have chosen to use the Spanish spelling throughout our website and photos. However, you will find SWA and other English references to it as HAV.